Intel’s Kaby Lake-G chip harbors a mystery. PCWorld has learned the company’s exciting CPU/GPU combo chip may actually be based on AMD’s older-generation Polaris cores rather than the newest Vega cores. This revelation doesn’t change how we feel about the chip, having already tested it (and liked it) in Intel’s Hades Canyon NUC, which earned an Editors’ Choice award. But an industry-standard system utility identifies the Kaby Lake-G as having an AMD Polaris bloodline. And we’ve discovered other evidence suggesting the chip’s GPU core is Polaris. 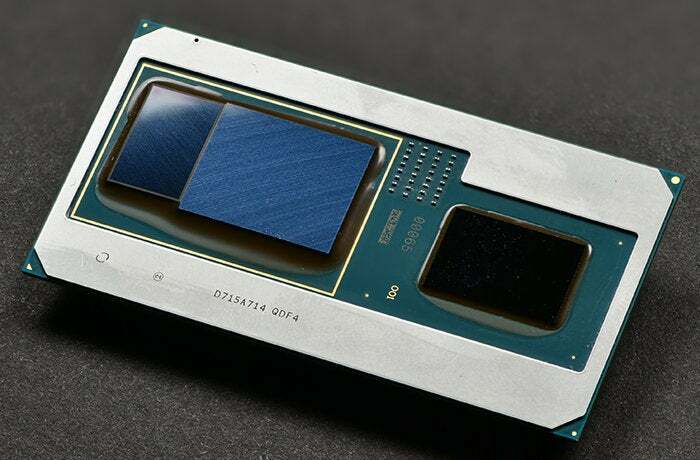 In January, Intel unveiled it had linked a Core i7 to an AMD Radeon RX Vega M with its advanced Embedded Multi-Die Interconnect Bridge. And thus the Kaby Lake-G mobile chip—and a once-unthinkable Intel/AMD partnership—was born. 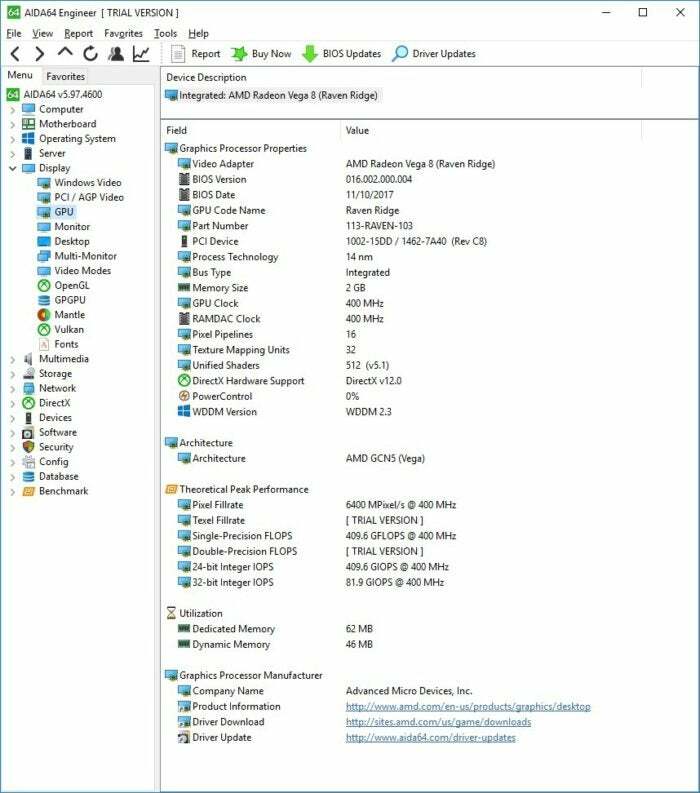 The newest AIDA64 identifies Intel’s Kaby Lake G as having a Polaris GPU—not Vega. If you have doubts about how AIDA64 details esoteric hardware, the version correctly identified a Ryzen 3 2220G as being based on Vega (see below). 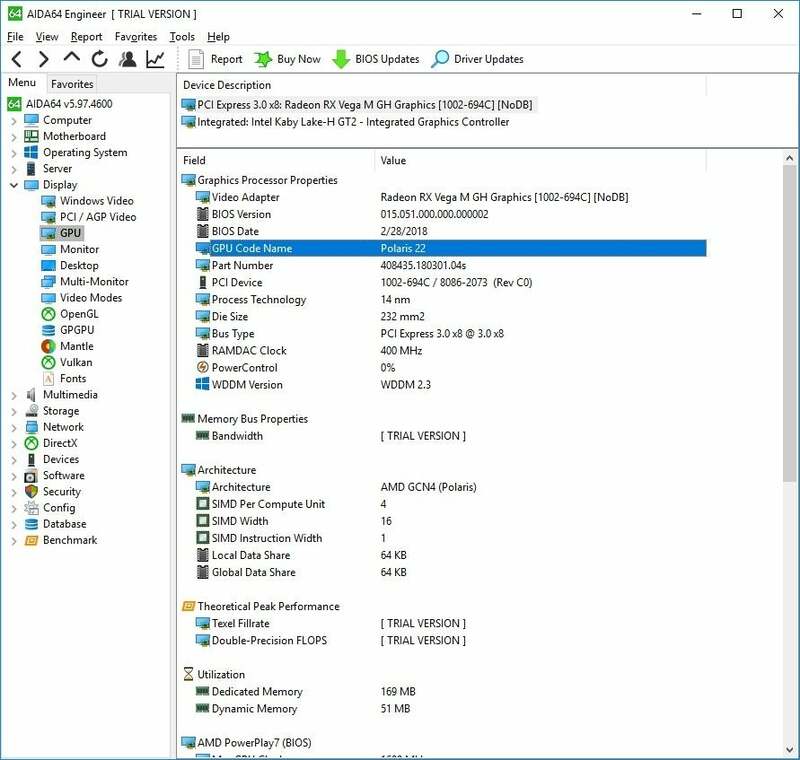 We also found AIDA64 correctly identified a Radeon RX 580 and Radeon RX Vega 56 card. AIDA64 says the lowly Ryzen 3 2200G is indeed based on Vega. But don’t just ask AIDA64. Among the key differences between a Polaris GCN-based chip and a Vega NCU-based chip are DirectX features. In this page lifted from AMD’s white paper detailing Vega, it clearly states Vega has DirectX 12.1 support, while Polaris does not. AMD’s own white paper on Vega states Polaris does not support DirectX 12.1, while Vega does..
To see what feature sets the GPUs in question support, we used Windows 10’s DXDIAG tool, which tells you down to the feature set what is available at the driver level. On a Radeon RX Vega 56 and on a Ryzen 3 2200G (both Vega), DXDIAG indicated the presence of DirectX 12.1 support. Meanwhile, on a Polaris-based Radeon RX 580 with the latest drivers available from AMD, the same utility confirmed there was no DirectX 12.1. We got the same answer with the Core i7-8809G and its Radeon RX Vega M chip. See all the results below. 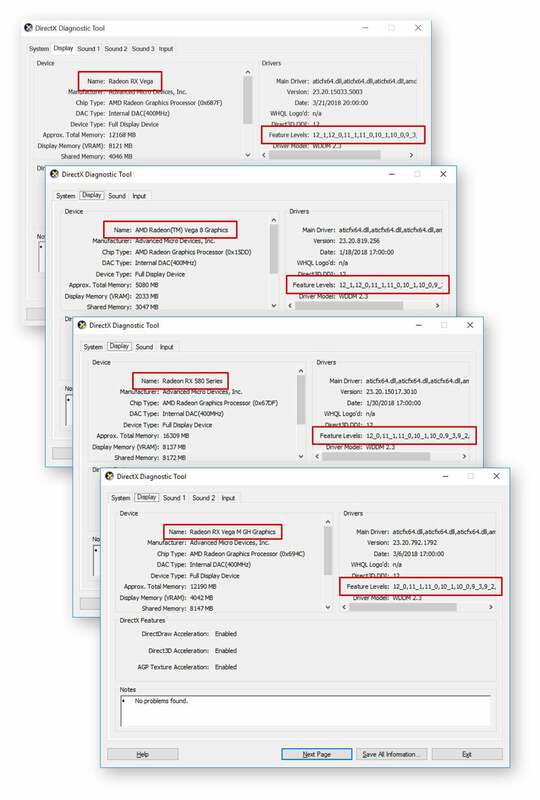 DXDIAG confirms the two Vega NCU-based devices support DirectX 12.1, while the RX 580 Polaris GPU and the Core i7-8809G with Radeon RX Vega M (bottom-most screengrab) do not. Now one might argue that the full feature set hasn’t been turned on in the drivers for the Kaby Lake-G. But do consider that the Radeon RX 580 Polaris card doesn’t show DirectX 12.1 support, even though we used the latest available drivers. So is it Polaris or Vega? Well, it may come down to the semantics of product marketing. AMD declined to discuss any details of Kaby Lake-G, and as a policy, typically does not discuss custom parts used in the Xbox One X or other game consoles and products, either. Although we could get neither AMD nor Intel to comment on whether Kaby Lake-G has the NGG, Rapid Packed Math or DSBR featured, we do know that it has two of those five features: the High-Bandwidth Cache Controller and the HBM2 memory. So do those two technologies make it a Vega? 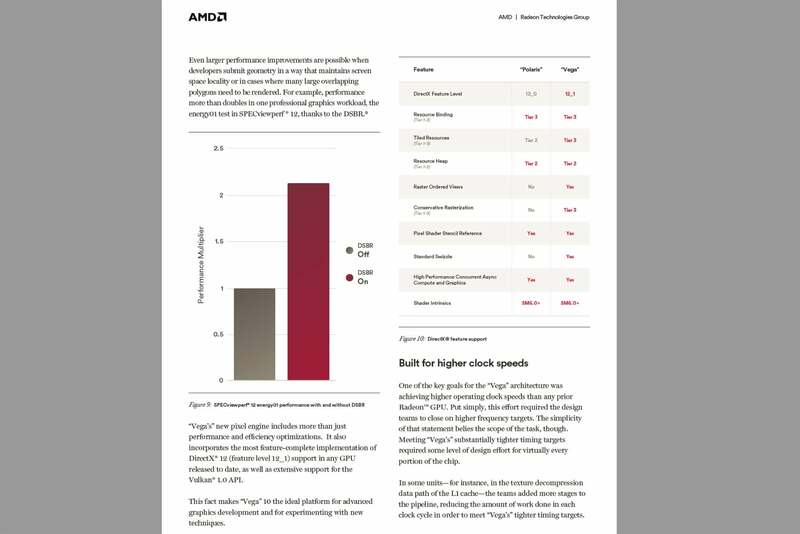 And to be fair, AMD’s Ryzen 3 2200G with Radeon Vega 8 Graphics has the NGG, Rapid Packed Math and DSBR—but lacks HBM2 and the High-Bandwidth Cache Controller. So is it a Vega-based chip? Or is calling that chip Vega funny business, too? 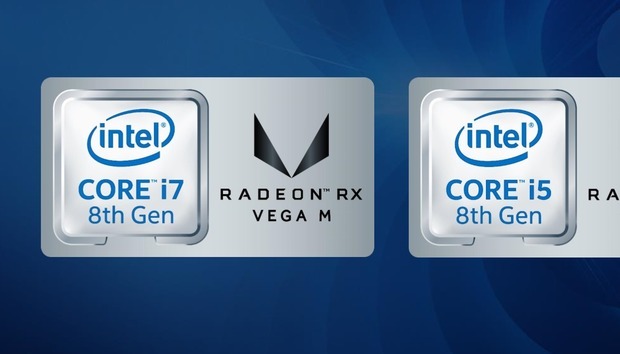 The biggest indicator that the Kaby Lake-G’s Vega name is deserved may come from AMD itself. Intel, after all, wouldn’t market Kaby Lake-G chips with the Vega name without approval from AMD. The ultimate judge of Kaby Lake-G isn’t obscure inside-baseball nomenclature, but what matters most to gamers: how it performs. And there’s no doubt that Kaby Lake-G performs as promised. Most reviews of the Hades Canyon NUC with its Core i7-8809G have been glowing with respect to gaming prowess. Given this success, Kaby Lake-G shouldn’t be afraid to fly its Polaris flag.